You know me, during each season I usually change things up more than once. For Easter, I like things a little more pastel. Easter is about the only time you'll see "pastel" being used around here. 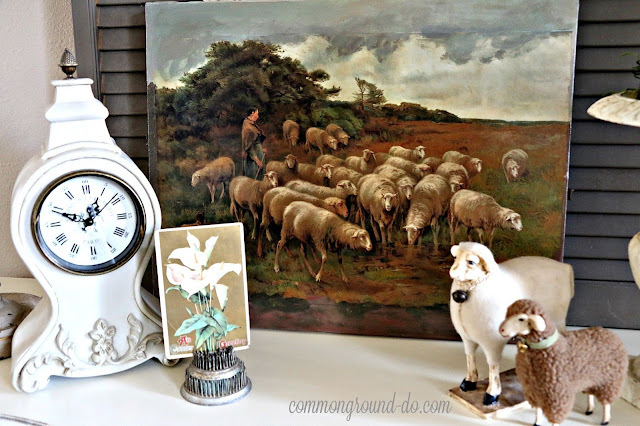 But for earlier in the Spring Season I've used various shades of browns and greens, mostly in the Kitchen Sitting Area, since I like to use my brown and pink floral quilt. I went with the same colors here in the Entry, using a brown and green check ribbon to hang my mossy O, and then my sheep print on canvas. I've been lazy and just kept my faux paperwhites in the iron urn. Their simplicity just seems to work here, since lots of other things like prints, and various seasonal do-dads can get busy. 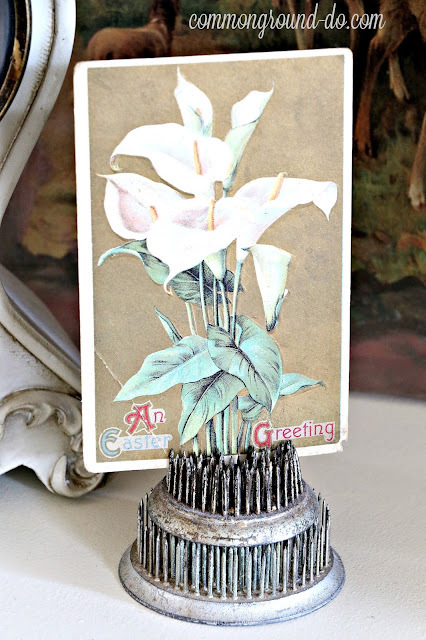 I looked through my stash of Vintage Easter postcards and found this one that fits the color scheme. It's hard to see, but the background on this postcard is really a beautiful metallic gold. These little fellas fit right in with the rest of the sheep. "Do you think they can see us? No... We blend right into the painting! Quiet, you're ruining the ambiance around here." This spot will be getting yet another transformation next week. I have some bunnies and Easter goodies to bring out. I thought I'd better share it while it's still actually here. I need to find some new wired ribbon for Easter, Hopefully, in a Pastel Plaid. Maybe that will be a good excuse to get me out of the house, and then motivated to go dig in the garage for the rest of my Easter goodies. My pea brain has been pondering plants and decorative pots. ...except for a little noise here in the Entry. 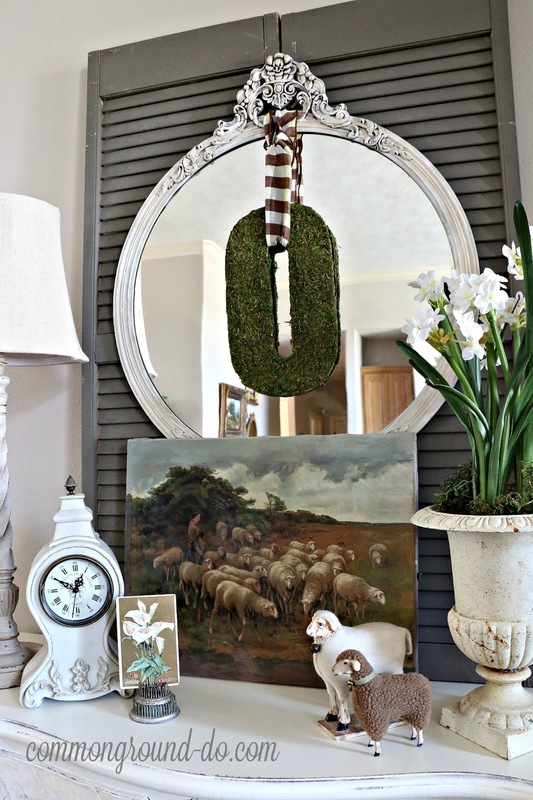 I love your spring lambs. I love sheep and yours are so adorable! We'll just let those little guys think they're part of your beautiful painting - so adorable! 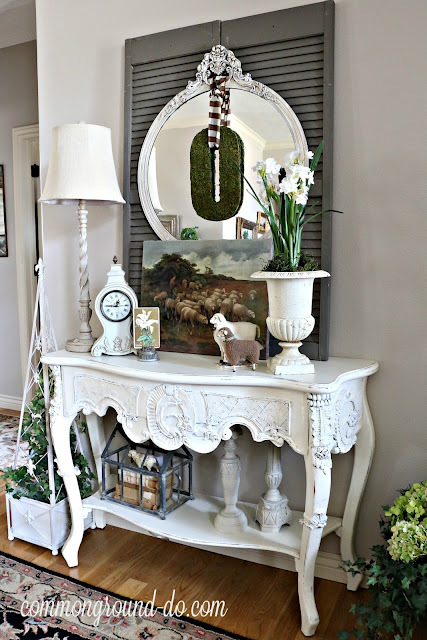 Such a perfect spring / Easter entryway. Beautiful vignette for your entry, Debra. Happy Spring! Hahaha, your conversation between the sheep is hilarious. When I first saw the vignette (which I really like and remember that canvas print), I was thinking along the same lines. They look as though they're in front of a theater backdrop. I have always loved your lambs but have never found any as nice as yours....love what you did with the print, very clever and creative.. Your use of white as accents does help with busyness; good idea. I am enthralled with your sheep. I've always loved them. Wish I could find some! Beautiful Debra!.....In love with your amazing sheep painting! Happy Spring! 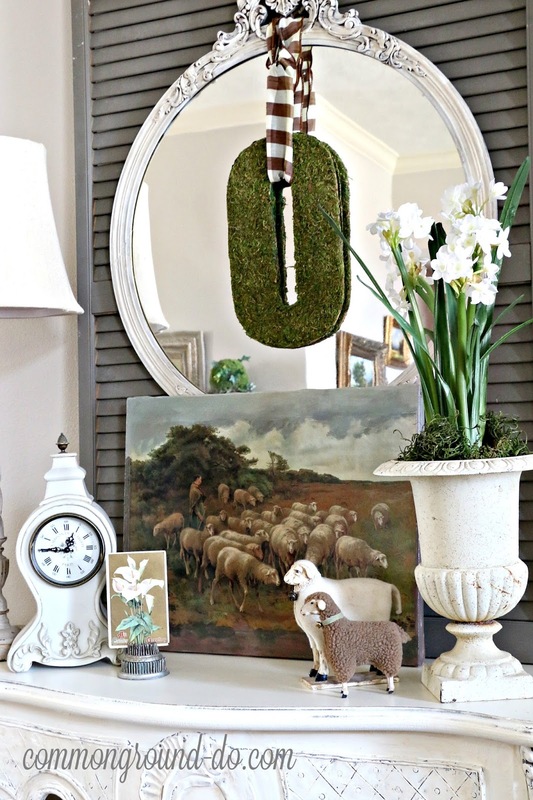 I'm in love with that gorgeous sheep painting. I'm glad the other little guys were convinced they were part of the gang! 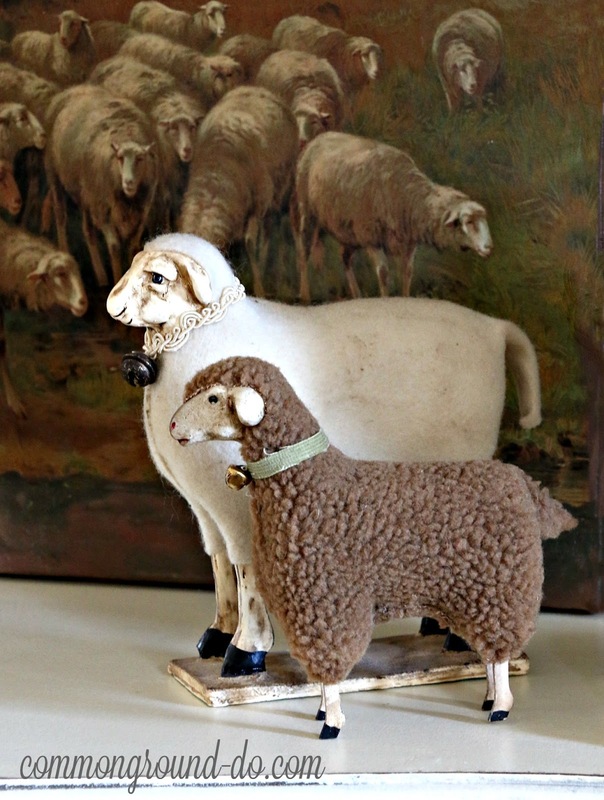 You can never have too many sheep. Why can't I find a pretty mirror like yours in photos? Do you ever feel that you have lots of mirrors nut not exact one really want? 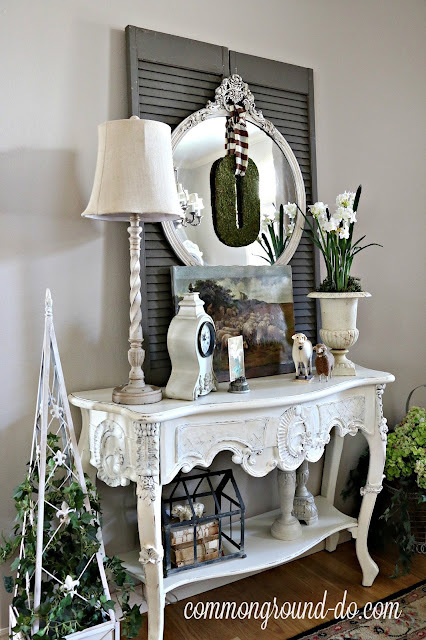 That white mirror with embellishments on it is so right for your home and style. Love your paintings and sheep. Never see sheep here or maybe just not looking right, will need to pay better attention.